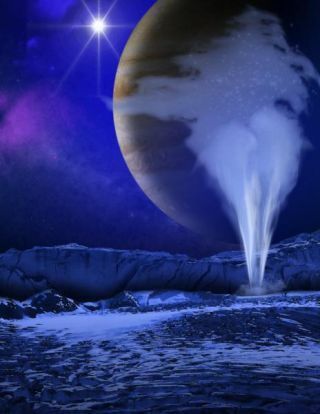 An artist's illustration of a plume of water vapor spouting from the surface of Jupiter's moon Europa. If Jupiter's moon Europa has geysers, the natural engines that power them are well-hidden. Scientists have re-examined data from NASA's Galileo mission in greater detail in search of regions on Europa warm enough to be linked to plumes of water vapor. If hotspots exist on this moon — which harbors a huge ocean of liquid water beneath its icy shell — they will most likely remain hidden until NASA's Europa Clipper spacecraft arrives at Jupiter in the late 2020s or early 2030s, the researchers determined. In an effort to solve the mystery, Julie Rathbun and her colleagues turned to data collected by Galileo when it orbited Jupiter in the 1990s and early 2000s. Rathbun is a senior scientist at the Planetary Science Institute in Tucson, Arizona. The researchers had searched the moon for heat signals almost a decade ago, before the potential plumes were spotted. Now, they returned to examine the two potential source regions more closely, looking for signs of heat that might indicate geological activity. The results were less than encouraging. "We didn't see any hotspots at those locations," Rathbun said yesterday (Oct. 22) during a news conference at the American Astronomical Society's annual Division for Planetary Sciences meeting in Knoxville, Tennessee. But that doesn't necessarily mean Europa isn't spouting off, added Rathbun. Plumes are common throughout the solar system. Jupiter's moon Io is constantly shooting volcanic material into the air. Saturn's icy moon Enceladus famously blasts water vapor and other material from its subsurface ocean into space via a set of geysers near the south pole. And Earth is rich in geysers, from Yellowstone National Park's Old Faithful to Iceland's Great Geysir. Firing off the gas that makes up these plumes requires an energy source, which usually heats up the ground around the plume source. Enceladus, Io and Earth all have hotspots around their geysers and volcanoes. But not Europa, as far as we can tell. Rathbun and her colleagues saw no hotspots at either of the purported plume locations described in the Galileo data. There are four possible reasons for this result, Rathbun said. First, it's possible that the jets don't exist. It's also possible that the hotspots exist but are subtler than could be detected with Galileo or the Earth-based Atacama Millimeter/Submillimeter Array (ALMA). Another option is that the plumes are sporadic and just didn't fire off while Galileo was nearby. Finally, Europa's plumes may operate differently from the geysers on other worlds. Both Europa and Enceladus are icy moons, and each is thought to host a subsurface ocean. So, it's no surprise that the planetary scientists based their Europa search on the geysers confirmed on Enceladus. The geysers from Saturn's moon come from long, narrow "tiger-stripe" fissures with roughly the same area as that probed on Europa, and the expected temperatures are also similar. It's possible, however, that Europa's plume regions have a different configuration than those of the Saturn satellite. "I don't think it's a tiger stripe [that produced the plume], but there could be some small source that's there that we're just not detecting," Rathbun said. Timing is another concern. Galileo explored Jupiter and its moons from 1995 to 2003, more than a decade before Hubble spotted the plumes. If Europa's fountains are sporadic, their hosting sites may not yet have become active while Galileo was looking. Similarly, ALMA peered at the moon several months after Hubble's observations, potentially giving the area time to cool off. Sunlight further complicates the issue. At the beach, sand and rocks heat up and cool at different rates based on their composition. After the plumes were first spotted, ALMA identified a region near a young crater called Pwyll that seemed warmer than surrounding areas. However, Rathbun said that Galileo showed that the same region is coolerthan its environment on the nightside; ALMA's observations, like all those made from Earth, show only the moon's dayside. Rathbun said that the variations most likely originated from features with different compositions. "It's much more consistent with different thermal properties than there being a hotspot," she said. Ideally, the same instrument would compare daytime and nighttime observations to rule out heat from the sun as an explanation for the temperature differences, but unfortunately, Galileo didn't gather daytime images of the puzzling region. Rathbun said the final possibility is that the plume-generating mechanism on Europa doesn't heat things up the way familiar geyser features do. It's currently unknown what kind of mechanism could do that, but she said the possibility can't be ruled out. "I am constantly amazed at how many things we find in the outer solar system that don't make any sense," she said. While there isn't enough data to determine which of the four explanations likely represents reality, Rathbun said that her favorite option is the bizarre answer. "I'd love it if there's something different going on," she said. "That's always the most fun." Europa probably won't be able to keep such secrets for much longer. NASA's Europa Clipper spacecraft, which is currently scheduled to launch in 2022, will make 45 flybys of Europa at altitudes ranging from 1,700 miles to 16 miles (2,700 kilometers to 25 km). One of the instruments Clipper will carry is the Europa Thermal Emission Imaging System (E-THEMIS), a heat detector that will take thermal images of the moon at various wavelengths. "If there is a hotspot somewhere on Europa, then E-THEMIS will see it," Rathbun said.